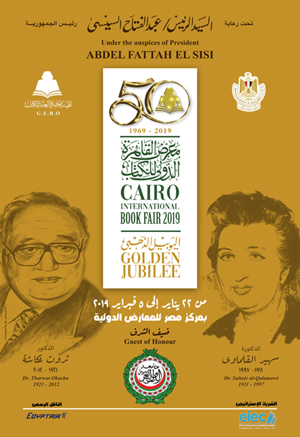 The fiftieth annual Cairo International Book Fair opens on Wednesday and will run until 5 February, featuring 1,273 publishers from 35 countries, and for the first time is taking place in the outer suburbs of the city. The fair has moved from the fairground in Nasr City to the Egypt International Exhibition Center in the Tagamoa El-Khamis, in the suburb of New Cairo. Ines Abdel-Dayem, Egypt's culture minister, said that this golden jubilee edition will be an "exceptional" new shift for the fair. The new venue covers 45,000 square metres, housing 748 publishers and 525 publishing agents, and will comprise of 723 sections. There will be no Sour El-Azbakeya this year, the landmark second-hand books section. Haitham El-Hajj Aly, head of the body that organises the fair, the General Egyptian Book Organization (GEBO), said that they had not banned used-book sellers from participating in the fair; rather the sellers themselves did not want to abide by the rules of the fair this year, thus they will not participate. However, according to the GEBO’s press release, there will be six used-books sellers at the fair. The 108 used-book sellers who are not participating have decided to hold their own fair in their usual place next to Attaba metro station from 15 January to 15 February. 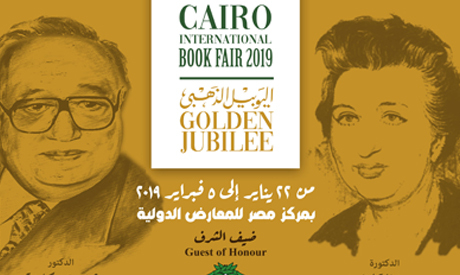 This year's guest of honour at the official book fair will be the Arab League, and the people honoured this year are Tharwat Okasha (1921-2012) and Suhair El-Kalamawy (1911- 1997). The fair’s “Person of the Year” is Abdel-Rahman El-Charkawi (1921-1987). As it is the case every year, the fair will have a very busy cultural agenda, with 419 cultural events, 144 artistic events, 8 writing and plastic arts workshops, and 600 book signings planned. The new venue solves the problems with the previous location, the Nasr City fairground, where the fair was hosted in tents that were vulnerable to bad winter weather like rain and sand storms. However, the new venue is far from the central parts of the city, and unlike the previous venue is not on the metro line. To overcome this issue, the General Egyptian Book Organization is cooperating with the Cairo Transport Authority to provide bus lines and certain stations designated for fair visitors. The stations will be located in Abdel-Moneim Riad Square, Abbasiya, Giza Square, Mazalat, Amiriya, Nozha El-Gedida, and Saqr Koraish. There will also be a bus station at the fair from which buses will leave every 10 to 15 minutes, with a ticket price of EGP 5. In addition, the GEBO has agreed with Mowasal Masr Bus Company to double its buses on its three lines passing by the fair. The lines are the Abdel-Moneim Riad Square line, the Ahmed Helmy Line, and the Saray El-Kobba line.